Although not exclusively sold as such, the BeoLab 4 was introduced as the ideal loudspeaker for the BeoSound 4 music system. Following a long line of B&O miniature loudspeakers, the design was geared towards freedom of positioning, so a wide range of stands and brackets were available for it allowing table, floor, ceiling and wall placement options. BeoLab 4 was also suggested for use with a home computer or as rear channel loudspeakers, a versatile model indeed. Text copyright © Beocentral. Unauthorised reproduction prohibited. Within the slightly bulbous triangular-pyramid shaped cabinet were housed one 4” woofer and one 0.75” dome tweeter. The bass sound was boosted by designing the cabinet around the bass-reflex principle, where a tuned port is used to allow some of the pressure waves in the cabinet to escape in a controlled manner. Two power amplifiers and an active crossover were also fitted inside the small cabinet, along with an electronic power supply that could operate on any mains voltage, along with the necessary control systems for Powerlink operation. A red/green indicator at the tip of the cabinet showed the operational status. Text copyright © Beocentral. Unauthorised reproduction prohibited. 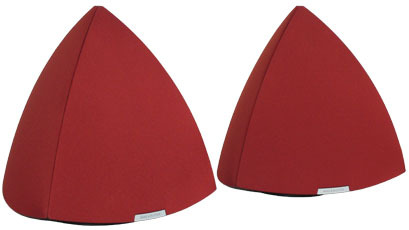 As the BeoSound 4 was intended to be one of the cheaper models in the audio system range, it followed that the loudspeakers recommended for it could not be made too expensive either. To this end, certain cost cutting measures were adopted. Firstly, the class D amplifiers were of a design that dispensed with the large filter coil that was normally fitted at the output. This sort of practice was common enough for mobile telephones and other appliances where compactness was key, but could hardly be considered “Hi-Fi” or good practice for any design intended for remotely serious listening. Secondly, the drive units were not magnetically shielded, preventing the installation too near some of the television sets in the same year’s range. Small B&O loudspeakers were usually naturally shielded by their metal cabinets, but the plastic BeoLab 4 could not use this method. Even the connection sockets were poor, only a single Powerlink connector was provided and the “line in” connector was a 3.5mm mono jack plug, a penny-pinching option that gave a noisier, less reliable contact than the RCA phono sockets that had been used previously. To finish off a fairly badly thought-out package, the floor stand offered no easy way to hide the wiring, other than a cumbersome clip-on attachment. Text copyright © Beocentral. Unauthorised reproduction prohibited. One “innovation” offered by the BeoLab 4 was this it was the first BeoLab loudspeaker with a dedicated “PC mode”, for connection to a home computer sound card. Although this seemed to be interesting and modern, it was in fact just a simple resistive attenuator that allowed the BeoLab 4 to give correct levels of output when fed from a source giving an output level that would normally be intended to drive headphones—not that clever or interesting after all. Text copyright © Beocentral. Unauthorised reproduction prohibited.